Following a rigorous weekend of hacking and coding, winners have been named and they're ready to present their applications at Enterprise Connect. The TADHack-mini Orlando has wrapped up, and winners have been named, but the Enterprise Connect fun is yet to begin. Today the winners will present their communications-enabled applications in the 3:15 p.m. session, "Hackathon After-Action Report: Meet the Hackers, See the Hacks." And take it from someone who was there to see first-hand all the presentations and cool ideas turned into reality -- you'll definitely want to put this session on your agenda and see the hacks yourself. On Saturday, 22 developers gathered at a co-working facility, Catalyst Spaces, in Orlando, Fla., along with 15 remote participants from around the globe, to form teams and kick off a weekend of coding what could be the next great communications-enabled app. In total, 13 hacks were presented for judging on Sunday afternoon, with each developer or team demoing the creations in hopes of getting a piece of the $8,000 prize pot. Following the presentations, sponsoring companies gathered in a private room to evaluate the hacks and pick their winners. That judging panel comprised Cisco Spark/Tropo, DataArt, Dialogic, Flowroute, Matrix, RingCentral, Telestax, Temasys, and Vidyo.io. Elder Connected Care -- An app for organizing family and friends who are helping care for elder health needs, all in a shared space, with an "Uber-like" feature enabling family members to add in nurses for ad-hoc consultations to explain complex medical documents or verify medication changes, for example. 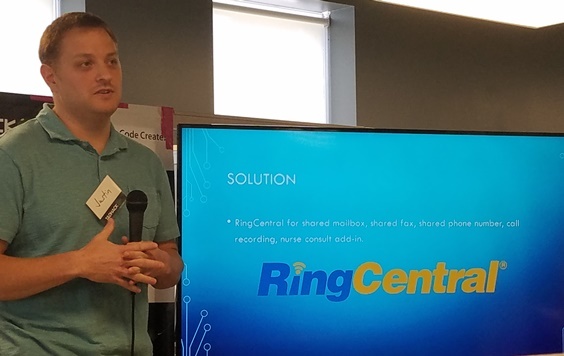 Created by Justin Haefner using RingCentral APIs, Elder Connected Care earned the biggest prize of the event, RingCentral's first-place award of $3,000. Convergence -- A service that allows people to avoid having to provide customer service agents with personal information (like Social Security numbers, for example) over the phone by using secondary communications to collect information and verify people; through the use of a RingCentral Glip bot, it also provides agents with talking points and customer profiles. Created by John Li and Ian Thomas, using RingCentral APIs, Convergence took that company's second-place prize, $1,000. Telemergency Line -- A service that provides virtual assistance for emergency situations using video chat and phone calls, with a "panic button" triggering the flow of emergency communications and support. 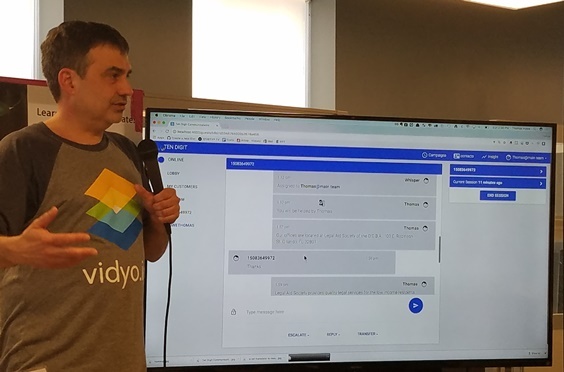 Created by remote team Germán Goldenstein, Rafael Viscarra, and Fernando Vasquez, using APIs from Vidyo.io, Cisco Tropo, and RingCentral, Telemergency Line developers took home a $300 prize from RingCentral. Whos_Up -- An app created by college students, for college students, enabling them to video and chat each other to get help on certain school projects without having to share personal contact information. 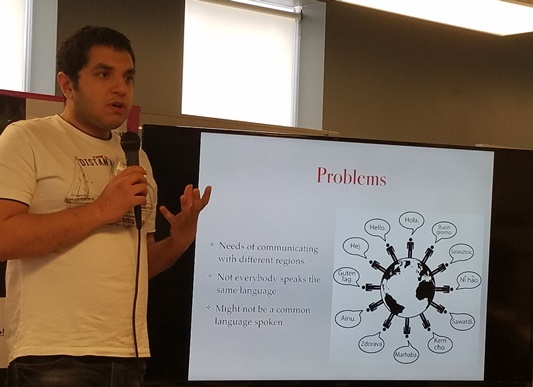 Created by a team from Valencia College -- Bruno Alves, Shibli, and Jerry Reed -- using the Vidyo.io streaming video API and Cisco Spark rooms, Whos_Up won a $300 prize from Cisco Spark/Tropo and a $1,000 prize from Vidyo. Remote Help -- An app for escalating a contact center interaction from messaging and voice into screen-sharing and two-way video. Developed by Thomas Howe using Vidyo APIs. Translator Bot -- A translator bot that lets each member of a Cisco Spark room to set his or her language choice and translates all chat messages to the selected language for each person. Created by Utku Yavuz and Janet Garcia using Cisco Spark, Translator Bot won the $600 prize from sponsor Cisco Spark. PhoneWall -- An app that provides phone numbers on demand and then routes calls and texts to an individual's phone, aimed at eliminating the need for people to give out their phone numbers. 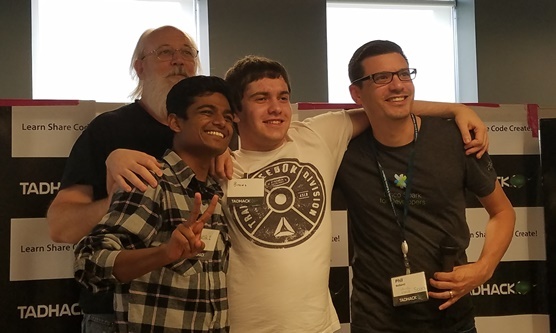 Also created by team members Li and Thomas (of the Convergence hack mentioned above), using Cisco Tropo, PhoneWall won a $100 prize from Cisco Spark/ Tropo. Legal Aid -- An app aimed at providing legal services through messaging, reducing more costly voice calls for those seeking social services. This, too, is a second hack, created by Howe (Remote Help, above) using Flowroute messaging APIs, Legal Aid grabbed the $1,000 prize from sponsor company Flowroute. Created by remote participant Mike Dauphinais using both Temasys and Telestax Restcomm, Burbudy won the $400 prize from Temasys as well as the $400 prize from Telestax/Dialogic/DataArt sponsor group. Two Player Hangman -- A two-player Web-based version of the classic hangman game, with an audio call feature. 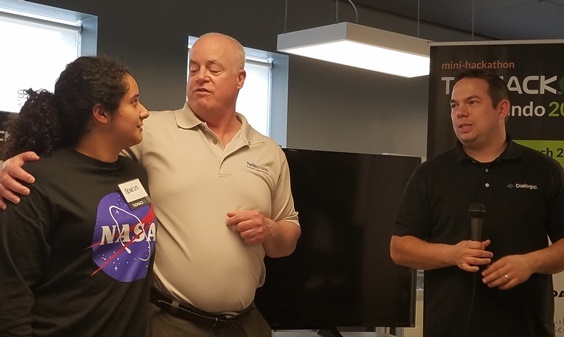 Created by first-time hackathon participant Genesis Barrios using Temasys APIs, after being abandoned by her teammate, Genesis persevered to bring home the $300 Temasys prize and an extra $100 for being a good sport from the Telestax/Dialogic/DataArt group of sponsors. Sky5 Studio Live! -- A live interactive recording studio enabling musical artists to collaborate with producers in a virtual studio with a video conferencing feature. 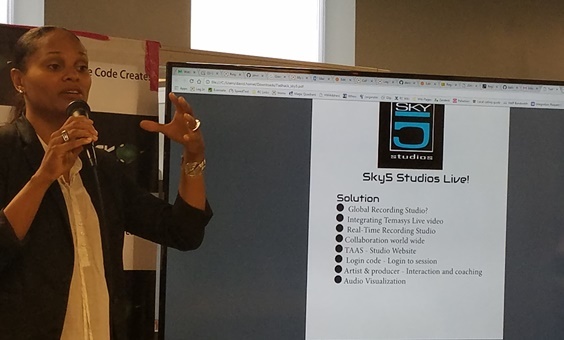 Created by Tshela (Sheli) Green using Temasys APIs, Sky5 Studio Live won the $300 prize from sponsor Temasys. Vboard.Me -- An interactive online classroom with screen share, whiteboard, and live calling features. Created using Temasys APIs by remote participant Dale V. Ross with team Ross Squared, Vboard.Me took home the $200 prize from Temasys. Pretty cool stuff, right? Attend today's 3:15 p.m. session, and you can see demos from winning developers of Elder Connected Care, Translator Bot, Sky5 Studio Live!, Legal Aid, Remote Help, and Burbudy -- all made possible by the democratization of telephony.